Hit My Spears One More Time! I love all spears; Britney, Excalibur and my all-time favorite ASPARAGUS! The earthy delicate vegetable is amazing this time of year and grown locally in Eastern Washington. Asparagus comes in many different varieties like, standard green, pencil, jumbo, purple and white. Each type has amazing virtues that need to be handled properly. Below are my tips on how to cook and care for your spears. Oh baby, baby, I shouldn’t have let you go. The standard asparagus are the thickness of a sharpie. 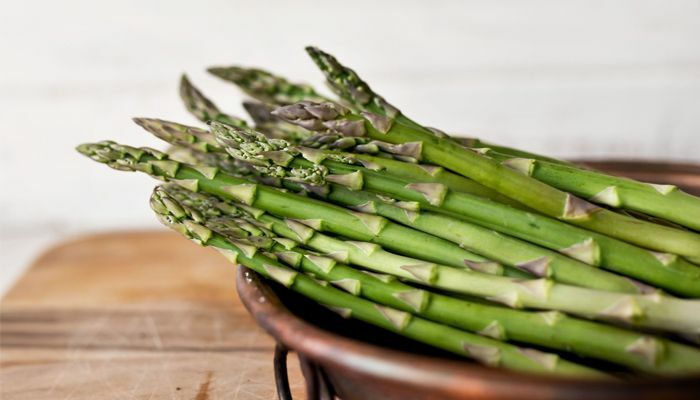 The asparagus is best served simply steamed or sautéed. Pairing: This asparagus lends well to white fish or white meats like pork, or chicken. Pencil asparagus can be thinner than an actual pencil. I love to finish dishes or pasta with them or even cut up and add raw to a salad. Pairing: Great with fresh citrus or a dry cheese like Parmesan. Jumbo asparagus is thick and can be woody towards the end so I always cut an inch off the bottom then peal the bottom 2 inches of the asparagus. This is amazing steamed and tossed in truffle oil with salt. You can also shave the asparagus with a peeler to make ribbons then dress with lemon juice, olive oil, and sea salt. Maybe some Parmesan too! Pairing: Lobster and prawns pair nicely with the jumbo asparagus. Purple is absolutely gorgeous but looses its color when cooked too long. The best way to hold the color is to boil them in salted water for 30 seconds then run under cold water(also called blanching). Once dried you can finish salads, pastas or sauces. Pairing: Purple is not as earthy as the green so I tend to use soft cheeses and smoked salmon. Last but not least is the temperamental white asparagus. This asparagus is grown in the dark so it does not turn any color. The texture of white asparagus when raw is more like a jicama or a radish. When cooked it’s flavor is delicate and I love to pour buttery sauces over it or a simple quick cook. Pairing: Extraordinary with egg like a hollandaise sauce or a soft brie cheese.